Hadad Silversmiths create this set of medium-height silver candlesticks in completely smooth, unembellished 925 sterling silver. Total weight: 360 grams. Traditional Judaica silhouette meets sleek, highly-polished futuristic design in this eye-catching pair of medium-height sterling silver candlesticks from Israeli Judaica gifts designers Hadad Brothers Silversmiths. These Shabbat candlesticks are crafted from sleek high-shine polished 925 sterling silver and are free from any engraving, carving, or embossing elements. The mirror-like smoothness allows the beauty of the fine silver and top-quality craftsmanship to shine. 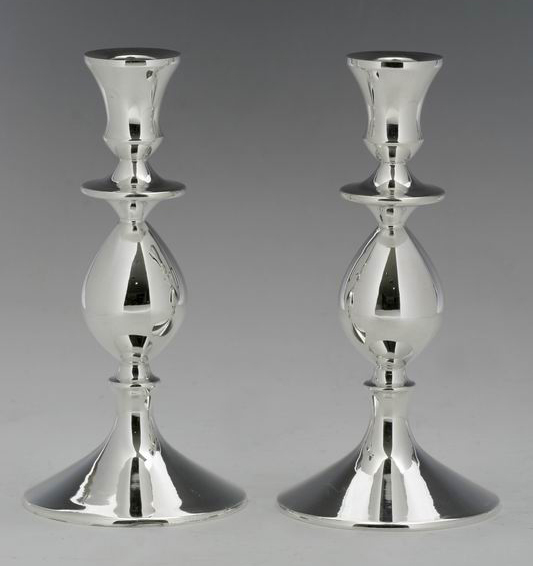 While ultra-modern in finish, these candlesticks nevertheless echo the shaping of traditional silver Judaica. A round base angles up to a stem crafted in three sections. A small silver lip protrudes beneath the main part of the stem, a slightly elongated bulb. A wider silver lip of the same diameter as the widest part of the bulb sits above it, beneath the candle holder. The candle holder itself is fashioned in the form of a simple silver chalice to keep the Shabbat candles steady. The candlesticks stand 7.1 inch (18 cm) high and weigh a combined .79 lbs(360 grams). The flame of Kabbalat Shabbat or holiday candles will be reflected ten-fold in the glasslike finish of this candlestick set, making them the true visual centerpiece of your table setting. Whether you're using them yourself or giving them as gifts, these candlesticks are made to last and will be passed down for years. A wonderful addition to any collection of sterling silver Judaica, this set is sure to be a hit with anyone who appreciates clean, contemporary interpretations of classic Judaica design.